When it comes to big blue catfish, the 89,000-acre two-state Lake Texoma is a tough lake to beat. With several Oklahoma and Texas state records – not to mention a former International Game Fish Association (IGFA) world record to boot – there's not much argument with that statement. But the question that many anglers ask is why is that all true? “We have successful reproduction every year,” said Paul Mauck, the now-retired Oklahoma Department of Wildlife Conservation biologist who oversaw the Sooner State side of the reservoir for many years. 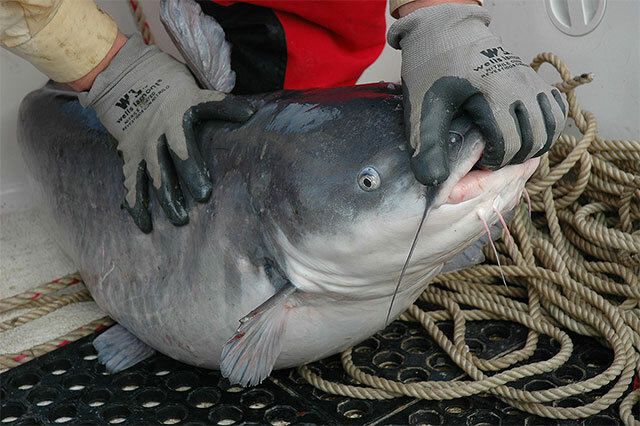 “There (has been) a healthy population (of blue catfish) in Lake Texoma," he added, noting that at times, population surveys in past years have shown catch rates as high as 250 to 300 blue cats per hour. With those blue cats ranging from youngsters hatched the same year all the way up to 60 or more pounds, Mauck said that when it comes to blue cats in Texoma, the reservoir has historically been good. For starters, Mauck pointed to the fertile two-river system that feed the lake – the Red River from the west and the Washita River from the north, two streams that helped cause massive spring and early summer flooding on the lake earlier this year. But like other flood events, such high water cycles help recharge the lake's nutrient base. “Each of those (rivers) brings in nutrients, which drives the production of food in the reservoir,” Mauck explained. “Plus, the reservoir has enough salt in it and that helps clear the water. "The water that flows into the lake is a very muddy red when it comes in, it’s turbid. But by a week or so after inflow, the lake has the ability to clear itself. And you need clear water, or relatively clear water, for photosynthesis to take place." What's the big deal about the latter statement there? "That’s important for primary food production," said Mauck. In other words, clear, fertile water is important for Texoma’s forage base, the clouds of threadfin and gizzard shad that nervously roam the lake much to the liking of Texoma’s striped bass, largemouth and smallmouth bass, and of course, its big blue catfish. Thanks to that ample supply of shadalicious groceries, Texoma’s healthy population of blue catfish has a chance to grow up to maturity. And that is what’s necessary for blue catfish to grow to world-class proportions in Texoma – or any other lake, for that matter. Early on in its life, that typically means a threadfin shad for a Texoma blue cat. But later on, both the threadfin and its shad cousin are fair game. “A blue cat's mouth size is relatively small," said Mauck. 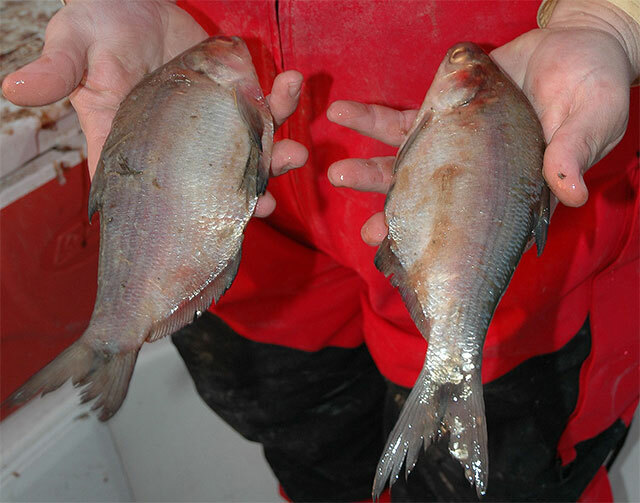 "But once a fish reaches 30-inches, then it can start utilizing the bigger gizzard shad (found) in the lake. Simple; when it comes to catching big blue whiskerfish, Lake Texoma is a Texas and Oklahoma fish-catching treasure that must be treated with great respect. “It takes a long time to get these fish up to be big fish over 30 pounds,” said Mauck. “Bigger fish are typically not all that good to eat, so if you catch them, take a picture of them and turn them back so that you can enjoy catching them again. With Lake Texoma serving as one of the best big blue catfish fisheries anywhere around, there's little doubt about that.